Russian naval vessels have conducted anti-submarine drills in the Sea of Okhotsk, the Pacific waterway between Russia and Hokkaido, as part of the country’s largest military exercise in decades. The “unprecedented” Vostok 2018 military drills — the largest war games since the fall of the Soviet Union — have seen about 3,200 troops from China join some 300,000 Russian troops for a week of war games in Siberia and the Far East, and over the Arctic and Pacific oceans. The maneuvers are scheduled to continue through Monday. 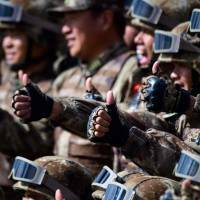 China, which participated for the first time, also sent more than 1,000 pieces of weaponry and 30 fixed-wing aircraft and helicopters to conduct strike and counterattack training among other drills, it said earlier, as Moscow and Beijing looked to showcase their deepening ties. Saturday, the Russian destroyer Vice Admiral Kulakov and a Ka-27 helicopter equipped to hunt submarines took part in the exercises, which included simulations of combat scenarios and anti-submarine maneuvering elements in the Sea of Okhotsk, the Russian Defense Ministry said. The waters are home to four Russia-controlled islands off Hokkaido, known as the Northern Territories in Japan and Southern Kurils in Russia. Tokyo and Moscow are involved in a long-standing territorial dispute over the islands. In a separate statement, the ministry said the drills included MiG-31 and Su-35 fighter jet interceptors appearing to approach their airspace without responding to ground control. The exercises also saw more than 10 Tu-22 long-range bombers hit targets resembling command centers, parked aircraft and warehouses where aircraft could be concealed. The exercises are believed to be the largest event since the Zapad-81 maneuvers. Those drills saw between 100,000 and 150,000 troops take part in September 1981, according to the CIA. During three days of exercises last week, troops from both China and Russia simulated repelling an invasion at the Tsugol training range in Russia’s Trans-Baikal region. Chinese State Councilor and Defense Minister Wei Fenghe inspected troops during the joint exercises, saying the drills reflect China and Russia’s “confidence and determination to jointly safeguard regional peace and security, and the exercise enhances the two militaries’ ability to respond to multiple security threats,” according to the state-run China Daily. Shao Yuanming, vice chief of staff at the Joint Staff Department of the Central Military Commission and the Chinese chief commander for the drills, said the two nations will continue their military cooperation and “explore new possible ways to boost their combat abilities,” the China Daily reported. 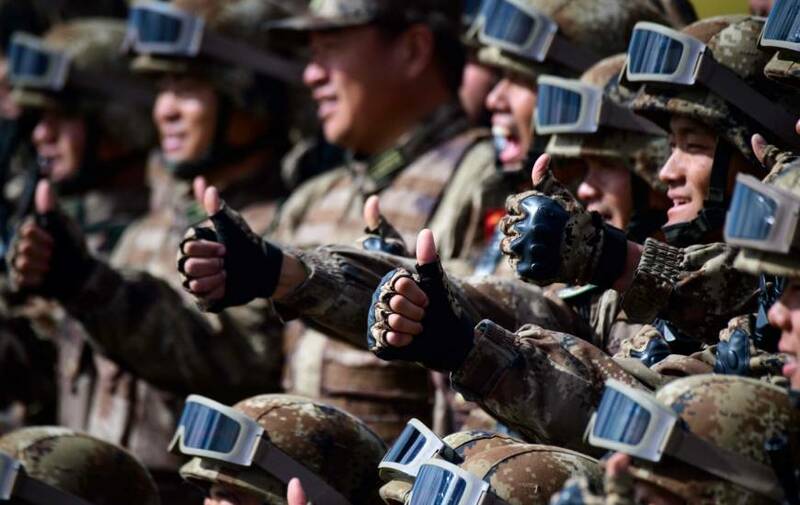 Beijing and Moscow have said the drills were not aimed at any third party, though some analysts have said the joint exercises are a worrying trend. The U.S., for its part, has worked to play down the significance of the drills. In an editorial Wednesday, the Global Times tabloid, operated by the Communist Party’s official People’s Daily newspaper, said the purposes for China’s participation were twofold. It called the drills defensive, but added a caveat.